The moment most USC fans have been waiting for, the official word that Graham Harrell has been hired as the new offensive coordinator for the Trojans. 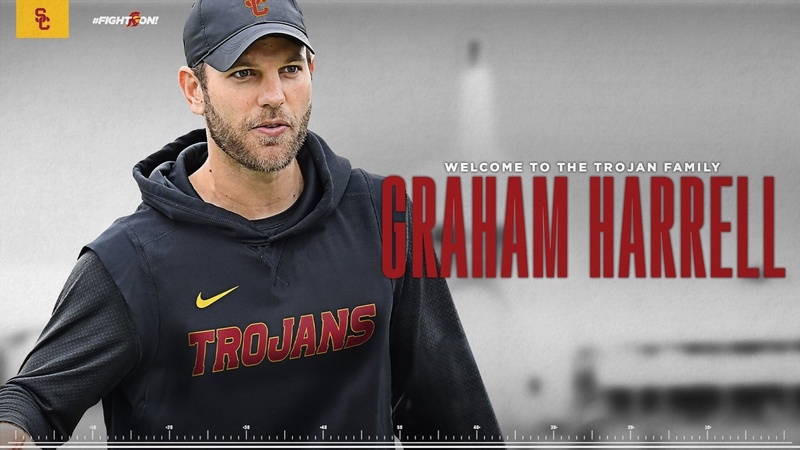 LOS ANGELES--Graham Harrell, who produced national Top 25 offenses the past 2 seasons while the offensive coordinator at North Texas, has been named USC’s offensive coordinator and quarterbacks coach, Trojan head coach Clay Helton announced today (Jan. 30). “We are very excited to welcome Graham into the Trojan Family,” said Helton. “In our search for an offensive coordinator, we wanted someone who could take our offense to new heights and whose system fit our current personnel. An individual who knows both the pass and run games and is an aggressive play caller on game day. Also someone who is a great teacher and who can develop quarterbacks to their full potential. Harrell, 33, was a record-setting, award-winning quarterback at a Texas high school and at Texas Tech, then earned a Super Bowl ring before pursuing a coaching career. He served the past 3 seasons (2016-18) as North Texas’ offensive coordinator and quarterbacks coach. After inheriting an offense that ranked in the nation’s bottom 25 in scoring, passing and total offense in 2015, he helped the Mean Green improve statistically in each category in 2016, including by 9.6 points per game. Then in 2017, North Texas was 19thnationally in scoring (35.5), 21st in passing (291.9) and 24th in total offense (455.1), and quarterback Mason Fine set school season records for passing yards (4,052) and TDs (31). In 2018, UNT ranked 12th in passing (306.8), 20th in total offense (460.5) and 26th in scoring (34.6), with Fine throwing for 3,793 yards and 27 touchdowns with just 5 interceptions, wide receiver Rico Bussey Jr. catching 68 passes for 1,017 yards with 12 TDs and running back DeAndre Torrey scoring 15 TDs on the ground. Fine was the 2017 and 2018 Conference USA Offensive Player of the Year, while Bussey Jr. was an All-Conference USA first teamer in 2018. North Texas also rushed for more than 150 yards a game in both 2017 and 2018. UNT won 9 games each of the past 2 seasons and qualified for bowl games each year that Harrell was on staff (2016 Heart of Dallas, 2017 New Orleans, 2018 New Mexico) after having only played in one bowl the previous 11 seasons. Harrell came to UNT from Washington State, where he worked for head coach Mike Leach as the outside receivers coach in 2015 after serving as an offensive analyst in 2014. He coached wide receivers Gabe Marks, who was a 2015 All-Pac-12 first-team selection when he led the conference in receptions and touchdown catches (school record 14) and was second in receiving yards per game, and Dom Williams, who had 73 receptions for 997 yards and 11 touchdowns. The 2015 Cougars led the nation in passing offense (389.2), won 8 games and won the Sun Bowl. Harrell was a record-setting quarterback for Leach at Texas Tech from 2005 to 2008, finishing his career with an NCAA-record 134 touchdown passes, the second-most career yards in NCAA history (15,793) and the third-highest career passing average (351.0). He also set NCAA career marks for pass completions average (31.2), as well as most games gaining 400-plus passing yards (20), games gaining 400-plus total yards (21) and seasons gaining 4,000-plus total yards (3). His career average of 486.3 passing yards against Texas was an NCAA record against one opponent. In each of his three seasons as a starter, his passing yardage figures placed in the Top 25 all-time at the FBS level (21st in 2006 with 4,555 yards, second in 2007 with 5,705 and sixth in 2008 with 5,111) and he was the first player with a pair of 5,000-yard passing seasons. In 2008, he was an All-American first teamer, finished fourth in the Heisman Trophy voting, won the Johnny Unitas Golden Arm Award, was a finalist for the Walter Camp and Davey O’Brien Awards and was a National Football Foundation Scholar-Athlete. His 5,111 passing yards led the nation and he threw 45 touchdowns with only 9 interceptions while completing 70.6 percent of his aerials. Texas Tech went 11-2, including a victory over No. 1 Texas, and played in the Cotton Bowl in 2008. As a junior in 2007, he won the Sammy Baugh Trophy and was the Gator Bowl MVP. He completed 71.8 percent of his passes, with 48 TDs. His 512 completions and 39.4 completions per game were NCAA season marks, as were his 11 games with 400-plus passing yards. Texas Tech was 9-4. As a 2006 sophomore, he threw 38 touchdowns. He was the Insight Bowl MVP as he helped Texas Tech overcome a 31-point third quarter deficit and beat Minnesota in overtime, the largest come-from-behind win in FBS bowl history. The Red Raiders were 8-5. He saw limited action in 2005 as a reshirt freshman. He earned his bachelor's degree in history from Texas Tech in 2007. Harrell played for the CFL’s Saskatchewan Roughriders in 2009, but spent the season on the injured list. He then was a quality control assistant at Oklahoma State for several months in 2010, working under offensive coordinator Dana Holgorsen, before resuming his pro playing career. Harrell played in the NFL with the Green Bay Packers for 3 seasons (2010-12), including on the 2010 Super Bowl XLV champions. He was with the New York Jets briefly in 2013. He played for his father, Sam, at Ennis (Tex.) High, throwing for Texas career records of 12,532 yards and 167 touchdowns. He led Ennis to the state Class 4A title as a 2001 sophomore. As a senior in 2003, he set state records for season passing yards, completions and touchdowns (4,825, 334, 67). Harrell was born on May 22, 1985. He and his wife, Brittney, have a 3-year-old son. His brother, Clark, played quarterback at Tulsa (2007) and Abilene Christian (2008-10); both Clark and his other brother, Zac, are now high school football coaches in Texas.